With Miami’s earliest exit in recent history last season and its biggest influx of freshman talent in a number of years, the 2016-17 season can’t get here soon enough. BoB has you covered, with its summer withdrawal-killing first look at the RedHawks’ Class of 2020. We take a look at all of the newcomers expected to don the Red and White this fall in Part II of our roster evaluation. Miami has seven new forwards on its 2016-17 roster, a mix of big players, small players, goal scorers and playmakers – a necessary combination for a winning team. As mentioned in Part I, only eight forwards return from last season, so at least four members of this class will be in the lineup each night. 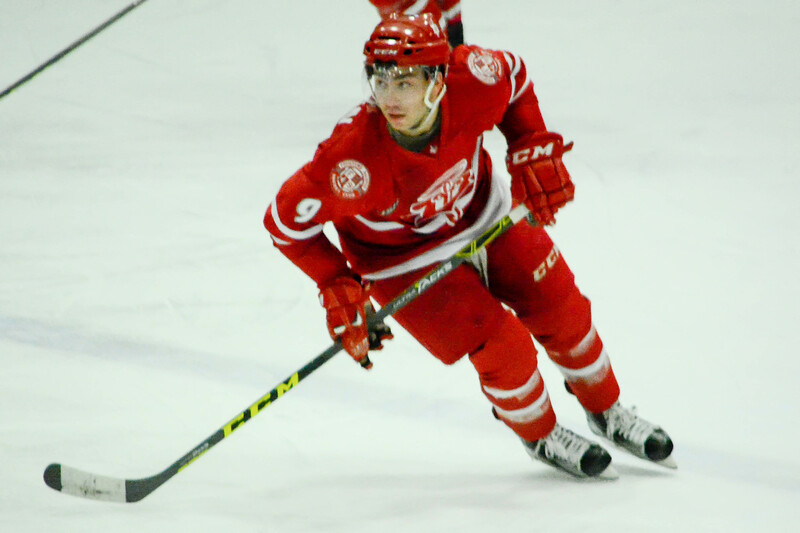 Alex Alger – A stud with Cranbrook in the Michigan high school system, Alger has spent the last three seasons in the NAHL, scoring 43 goals and dishing for 61 assists. He’s a slight skater at 5-11, 154 pounds and will be the first player in team history to wear a number in the 70s. His younger brother, Austin, is also a Miami commit. Karch Bachman – The only draftee among this class, Bachman was limited to 35 games last season but scored 14 goals and set up eight more for three USHL teams. Bachman was selected in the fifth round by Florida last season and is a product of the prestigious Culver Academy in Indiana. He is also 5-11, weighing 171 pounds, and Miami is hoping he can help light the lamp this season, an area the RedHawks struggled with much of 2015-16. Gordie Green – Green should be one of the more polished freshmen this season, having spent two-plus seasons with Dubuque of the USHL. He is a playmaker, although he’s also not afraid to stand in front of the net and redirect pucks when needed. Green finished with 12 goals and 27 assists last regular season, and he went 0-8-8 in 12 playoff games as the Fighting Saints won the Clark Cup. Maybe not the type of points producer as an Andy Miele or Austin Czarnik, but he should put up over 20 points a season. He’s definitely on the small side at 5-8-168. Carter Johnson – A late bloomer out of Manitoba, Johnson signed midway through this past season. He will provide the team some much-needed size up front at 6-feet-3, 208 pounds. Johnson came out of Swan Valley of the Canadian second-tier juniors to score 16 goals and dish for 21 assists in his first and only NAHL season with Corpus Christi in 2015-16. Willie Knierim – Knierim was ranked the 149th-best North American skater heading into the 2016 draft but was not selected. He’s an intriguing player because he has NHL size (6-feet-3, 212 pounds) and a solid skill set, albeit still a little raw. Like many big kids, it may take him longer to become a major contributor, but he hopefully he can contribute right away and continue to get better. Sean Kuraly was drafted highly by San Jose, but the development path in Oxford could be similar. And he’s just 18, a year younger than Kuraly when he put on the Miami sweater. Winning a Clark Cup with Green should help his confidence level. Carson Meyer – What a first season in the USHL. Meyer – another Columbus product – scored 32 goals and added 19 assists for 51 points for Tri-City, the highest marker and points total of any incoming freshman. He spent four years in the Junior Blue Jackets system, and he went 21-30-51 with the U-18 team his final season. Big-time goal scorers are obviously needed at Miami, and hopefully those outstanding USHL numbers will translate to Division I.
Christian Mohs – Another late signee, Mohs has been a points machine in the NAHL the past two seasons. Mohs racked up 101 of them in 116 regular season games in 2014-15 and 2015-16 with Minot. He turns 21 this month, which is obviously older for a freshman, but his experience could be a benefit on a team loaded with teens. The Minnesota product is 6-0-183, so he has decent size for a points producer. As documented in Part I, Miami will have an enormous challenge to replace Matthew Caito, Taylor Richart and Chris Joyaux on the back end. Four blueliners return (Colin Sullivan, Louie Belpedio, Scott Dornbrock, Grant Hutton), and while all are solid, at least two newbies will dress each night. Grant Frederic – Already 21, Frederic is another St. Louis-area player described to BoB by a scout familiar with Miami hockey as “(Kevin) Roeder but six inches taller”. Frederic’s younger brother, Trent, was just drafted by the Boston Bruins in the first round last week. He played in the NAHL in 2013-14 but has been a standout for USHL Green Bay the past two seasons, racking up eight goals, 19 assists and 208 penalty minutes. Frederic will likely be a favorite to jump in the lineup immediately. Bryce Hatten – Hatten suffered a major hip injury in a preseason game with USHL Cedar Rapids and was limited to six regular season games. He is 19 and played a full season with the RoughRiders in 2014-15, when he went 2-5-7 in 51 games. Hatten notched a pair of assists in four playoffs games this spring. He is 6-2-198 and will likely develop into a quality D-man for Miami. Hatten did miss almost an entire developmental season, so it will be interesting to see how he looks this fall, but he likely has a bright future in Oxford even if he isn’t 100 percent heading into 2016-17. Chaz Switzer – Switzer turns 19 next week but has played in the USHL for three seasons, logging 121 regular season games with Muskegon and Sioux Falls. He is definitely a stay-at-home D-man, having recorded just 11 points in the USHL, but he definitely has no problem mixing it up, as he has 294 penalty minutes. Switzer is a little on the small side for an NCHC defenseman and 6-0-195, but he has plenty of high-level experience for his age and could be a quality asset on the blue line for Miami. Miami will have four goaltenders with a total of 9:39 of collegiate experience entering 2016-17, but the RedHawks have gone through this before and have always been fine between the pipes. Whether it was ironman David Burleigh, Jeff and Eff, Cody and Connor or Jay and McKay, this team has an excellent track record in net under coach Enrico Blasi. Ryan Larkin – Larkin is the cousin of the Detroit Red Wings’ Dylan Larkin, and while he was limited to four games in 2015-16, he is one of the favorites to log the majority of playing time in net this fall. At 19, Larkin has logged 32 USHL games with Cedar Rapids and recorded a 2.38 goals-against average and .919 save percentage. Injured and done for the year by January, Larkin came to Oxford and got a head start on his class load late last season, so having a chance to be an informal member of the team the past six months can only help his transition to Division I.
Andrew Masters – Masters signed very late after a phenomenal season with Georgetown (Ont.) of the Ontario Junior Hockey League. He went 28-9 in the regular season with a 2.00 GAA, .934 save percentage and four shutouts, and he was 13-9 in the playoffs as the Raiders lost to Trenton in the finals. He is already 21, and it’s unclear what role he will play this season with Miami, but his resume of winning can only help him as he heads into his first season of collegiate hockey. Chase Munroe – A Chicago-area product, Munroe posted stellar numbers in his third and final NAHL season with Minnesota. He went 19-14 with a 2.22 GAA and .912 save percentage, notching three shutouts. Munroe also had a solid rookie campaign with Wichita Falls in 2013-14 but played for three teams the following year and was limited to 16 games. At 6-4-216, Munroe takes up a lot of net and the 21-year-old should compete for a large chunk of playing time right away. Posted on July 2, 2016, in 2016-17 and tagged 2016-17, freshmen, preview. Bookmark the permalink. 1 Comment.